I’m concerned about Google having a monopoly on search, and tracking their users for search terms, and much more. So use another search engine. First, I set the default Search Bar plugin to IxQuick from one of the many selections at the Mycroft project . Now any keywords you type into the address bar will be looked up by IxQuick. 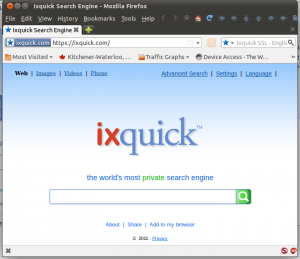 IxQuick is a metasearch engine, which searches All the Web, Digg, Qkport, Ask/Teoma, EntireWeb, Wikipedia, Bing, Gigablast, Yahoo, Cuil and Open Directory. Almost everything except Google. IxQuick claims that it does NOT collect or share your personal information , and keeps logs no longer than 48 hours. All in all, I’ve been very pleased with the results IxQuick provides. 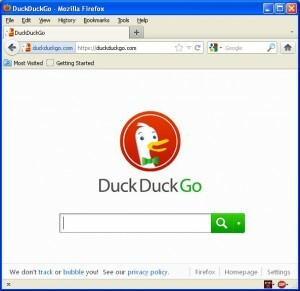 DuckDuckGo (https://duckduckgo.com/) is another alternative search engine that claims it does not collect or share personal information . To put DuckDuckGo in the Search Bar, browse to the DuckDuckGo site, pull down the list of search engines, then click on “Add DuckDuckGo”. Note that there are many other references to Google in the about:config settings, so if you make only these changes you’re still not Google Free.